This article critically discusses the possibilities and limitations of videogames in dealing with contentious and emotionally-charged issues from contemporary history, in particular civilian perspectives on war and the trauma therefrom. In doing so, it briefly examines how history and war are represented in mainstream videogames and, subsequently, how these dominant frames of representation are challenged and refashioned within the emerging genre of historical serious games. Regarding the latter, this article focuses on a case study of Czechoslovakia 38-89: Assassination, a serious game on contemporary history, which we developed in 2015 at Charles University and the Academy of Sciences of the Czech Republic. It specifically examines how the Czech historical memory of World War II is presented via the game and it critically discusses design challenges stemming from adapting real persons’ - oftentimes ethically-and emotionally-loaded - testimonies in order to construct in-game narratives. In particular, the article discusses the intersections and tensions between authenticity and fiction, realism and schematization, and narrative and procedure. Finally, the article critically investigates the perception and acceptance of Czechoslovakia 38-89: Assassination by Czech teachers and students, as well as the general public in the Czech Republic. To this end, it analyzes how the game’s meaning potential is disseminated to and negotiated by concrete audiences in different contexts of reception. Many videogames deal with real historical events, constructing digital representations of the latter and communicating them to players. In this sense, as Chapman (2013) has argued, historical videogames have become one of the most widespread and successful forms of popular history. This, alongside their chosen historical content, makes them potentially highly influential histories that are generally experienced in informal settings. Atkins (2005; cited in Chapman, 2013, p. 313) calls videogames a “new form of historical text” that is both massively popular and also promises to change the ways in which history is received and consumed by a popular audience. Similar to other popular forms of history, such as films, novels and cartoons, historical videogames are widespread and often-shared sources of historical images and narratives. They have the potential to be particularly powerful in the construction of cultural memory because they are often accessible, engaging and widely experienced (Chapman, 2016, p. 7). As a result, videogames are an important place for exploration of the intersection between historical memory and digital culture. As such, they help us understand how popular history is constructed and what it means in a changing contemporary society. Echoing Zimmerman’s (2013) notion of a “ludic century,” just as films helped to illuminate and expose “the past” of the 20th century, digital games now depict the past within the 21st century. In the words of Atkins (2005; cited in Chapman, 2013, p. 313), “history is already in play, played with and playfully (mis)represented”. As videogames become a globally pervasive medium, it is crucial to study both the symbolic and ideological dimensions of in-game representational politics and the possibilities and limitations of the medium critically; particularly in relation to contested histories and spaces of conflict. Historical videogames are often criticized or dismissed on the grounds that they do not represent “proper history” (Chapman, 2016, p. 3). This criticism echoes similar critiques of other forms of history that emerge in popular culture, such as historical movies and novels. This critique mainly rests on two assumptions: that “the current practice of written history is the only possible way of understanding the relationship of past to present and, second, that written history mirrors ‘reality’” (Rosenstone, 1995, p. 49). In his seminal work on history and videogames, Chapman (2016, p. 4) calls these claims into question by arguing that the assumption that real history is coterminous with the printed book and “only printed text is capable of carrying serious argument” (Schama, 2004, p. 23) is a mistake, since written history both emerges from oral history and is interwoven with a number of continuing performative traditions of engagement with the past. At the same time, perspectives based on the primacy of the word underestimate the power and capabilities of images, which are often part of popular history forms (Chapman, 2016, p. 4). According to Chapman (2016), game designers turning the content of the past into a game are actually not doing anything very different from the narrative-making terms that historians use when they write. Similar to other producers of popular history, historical game designers “make meaning out of the past, they both engage and produce the larger historical discourse and their produced histories are referential - that is to say they are constructed in relation to other narratives about, and evidence of, the past” (Chapman, 2016, p. 4). Similarly, Elliott and Kapell (2013) argue that game designers’ practices of telling history are comparable to those of historians creating histories: with the issues of who is telling the story, how they are telling it and what they find important becoming central to historical videogame research. This is not to say that the chosen form is not an important part of how history is constituted or that the different forms of history are equal. On the contrary, I argue in this article that the affordances and limitations of videogames are crucial in the way they typically handle history and war. Nevertheless, in accordance with Chapman (2016), I argue that videogames as a media form are capable of critically engaging with and “seriously attempting to make meaning of the past” (Rosenstone, 2006, p. 37), even though this is mostly not the case with mainstream videogame production. In this article, I critically discuss the possibilities and limitations of historical videogames in dealing with contentious and emotionally charged issues from contemporary history; in particular the civilian perspective on war and the trauma therefrom. In doing so, I briefly examine how history and war are typically represented in mainstream videogames and, subsequently, how these dominant frames of representation are challenged and refashioned within the emerging genre of historical serious games. Regarding the latter, I present a case study of Czechoslovakia 38-89: Assassination, a serious game on contemporary history, which we developed in 2015 at Charles University and the Academy of Sciences of the Czech Republic. Specifically, I consider how the Czech historical memory of World War II is presented via the game, and I critically discuss the design challenges stemming from adapting the real persons’ - oftentimes ethically- and emotionally-loaded - testimonies in order to construct the in-game narratives. In particular, I discuss the intersections and tensions we faced between authenticity and fiction, realism and schematization, procedure and narrative, and learning and gaming mechanics. It should be noted that, in the current case study, I focus on theoretical considerations about how to construct realistic and “authentic” historical content in a serious game. I do not address the general issue of designing an educational game and implementing it in a formal schooling environment. (We have discussed the latter issues elsewhere, see Šisler & Brom (2008) and Šisler, Selmbacherová, Pinkas & Brom (2014)). Finally, I critically investigate in this article the perception and acceptance of Czechoslovakia 38-89: Assassination by Czech teachers and students as well as the general public in the Czech Republic. In doing so, I utilize Erll’s (2008) method of pluri-medial analysis that looks into the processes through which the game’s meaning potential is disseminated to and negotiated by specific audiences in different contexts of reception. Some of the findings related to the perception of the game have been published in Šisler et al. (2014) and Pötzsch and Šisler (2016). Understanding the properties of a medium helps us to better comprehend its nature and its implications. Videogames have properties that precede their content: Games are models of experience rather than textual descriptions or visual depictions thereof (Bogost, 2011, p. 4). When we play games, we operate those models and our actions are constrained by their rules. As Frasca (2004, p. 21) puts it, videogames open a form of representation based on rules that mimic the behavior of the simulated systems. Unlike traditional narratives, games do not represent a particular event, but rather a set of potential events. Because of this, we have to think about games as systems and consider the laws governing their behaviors. At the same time, videogames let us play a role within the constraints of a model world. Unlike playground games or board games, videogames are computational. As a result, the model worlds and sets of rules they produce can be far more complex (Bogost, 2011, p. 4). The rule-system of a videogame is particularly important, because it shapes and limits the choices and decisions players can make during the game and their possible outcomes. In this regard, Bogost (2007) argues that games open a new domain of persuasion. He calls this new form “procedural rhetoric,” the art of persuasion through rule-based representations and interactions rather than spoken words, images or moving pictures. In his understanding, procedural representation is any representation of real or imagined systems through rule-based models. Several authors have criticized the concept of procedural rhetoric (Möring, 2013; Sicart, 2011), asking in particular whether it is possible for the procedures of the game to convey a meaning themselves independently of the game’s textual or semiotic elements. For example, Möring (2013, p. 239) calls into question Bogost’s concept of “pure” procedural rhetoric that “should work without textual elements”. According to Möring, this is, by definition, not possible in videogames given that games necessarily contain some form of textual or audiovisual elements. Even videogames in which these semiotic elements merely provide an informational layer addressing the game system instead of a thematic layer still feature semiotic elements. In other words, inferences on procedures in videogames are only possible through their semiotics. As I have argued elsewhere (Šisler, 2016), instead of utilizing the concept of procedural rhetoric, it is more useful to perceive videogame rule-systems as conventional structures. They provide game developers formulas for expressing their ideas, while simultaneously limiting these developers’ scope of expression with schematized, pre-defined patterns. Regarding our understanding of history and digital gaming, it is of crucial importance to consider not how rule-systems of videogames represent history, but more precisely how they shape, afford and limit possible representations of the latter. The construction of the videogame medium has an impact on the manner in which games typically handle history and war. The systematic nature of game rules and computer programming bias the videogame medium toward a mechanical and procedural representation of history. In this respect, Schut (2014, p. 259) argues that “a game functions like a machine: various parts are arranged like cogs and gears that impact one another based on input from the user”. This systematic nature of the videogame form is “further reinforced by the computer itself”, since a program code must be completely defined by rules, and its object cannot be ambiguous (Schut, 2014, p. 259). The discrepancy between historical processes and the rule-systems of games is widened by the fact that social rules are more organic and less mechanical than the rules of a videogame (Šisler, 2016). In particular, within the strategy-games genre, history often focuses on some combination of politics, economics and war (Schut, 2007). These games typically demonstrate the centrality of aggressive power and acquisition. Even though many strategy games include elements such as culture, religion or trade; on the procedural level the function of these elements is to help the player to become politically, economically and militarily successful. In this context, Galloway (2006, p. 103) argues that the transcoding of history into specific mathematical models erases its own historical content, because the diachronic details of lived lives are replaced by the synchronic homogeneity of code (for a critique of Galloway’s claims see Chapman (2013), also discussed below). We can find a different mode of representation of history and war in the first-person shooter games genre. These games typically strive for “realism,” yet this realism centers on the authenticity of weapons, sounds and combat scenarios. This “realism” is also established through photorealistic verisimilitude and topographical correspondence to the real world (Halter, 2006). Nevertheless, the historical realities of war constructed by the games are of a highly selective nature with certain parts missing or obscured. First-person shooter war games rarely feature civilians, particularly women and children, and tend to reconstruct modeled landscapes as being inhabited solely by combatants (Šisler, 2008; Power, 2009; Pötzsch, 2015). As a result, there is no possibility for civilian casualties caused by the players’ war efforts. These games thus present a “clean, sanitized and enjoyable” version of war for popular consumption; obscuring the realities, contexts and consequences of war. In other words, first-person shooters do not reproduce the real-world experience of war; instead they theatrically romanticize war (Power, 2009). At the same time, the visual “realism” of these games legitimizes these schematizations; recreating the “real” world and obscuring it at the same time. In this context, Pötzsch (2015) introduces the concept of “selective realism” that conceptualizes how “generic narratives and game mechanics [of the first-person shooter genre] selectively exclude negative and challenging aspects of war and violence” and encourage a pleasurable user-play experience that “avoids difficult ethical decisions in ambiguous moral terrain” (p. 2). As Schut (2014, p. 269) notes, even highly systematic and reductionist representations in videogames may allow for a greater variety of play and meaning-making than might be immediately apparent: this variety is achieved in particular through fiction, emergent play and contextualization. Moreover, the development of the videogame industry over the last decade (particularly the growing emergence of serious and independent games) has challenged the above-mentioned (mis)representation of war and history in mainstream videogames. Serious games such as Global Conflicts: Palestine (Serious Games Interactive, 2007), 1000 Days of Syria (Mitch Swenson, 2014), First Person Victim (Schønau Fog, 2011) and recently This War of Mine (11 bit studios S.A., 2014) all strive to provide more authentic and realistic accounts of wartime events. These games are typically based on personal testimonies, include multifaceted perspectives and revisit the civilian trauma of war. The fundamental questions here are: What is “real”? What is “realism” in videogames and how can it be communicated to players? As Galloway (2004) contends, one of the most central theoretical issues in gaming is how, and in what way, one can make connections between the gaming world and the real world; both from inside-out - in the form of affective action - and from outside-in - in the form of realistic representation. He further develops a distinction between three forms of realism in digital games: “realistic-ness”, referring to the general accuracy of the audiovisual representation; “social realism”, pointing to the believability of character interactions and narrative; and “behavioral realism”, indicating the authenticity of movement and object physics. Finally, Galloway (2006, p. 75) suggests that truly “realist videogames” should not be defined as mere realistic representations but as games that “reflect critically on the minutiae of everyday life: replete as it is with struggle, personal drama and injustice”. Taking a different tack, Bogost and Poremba (2008) discuss the possibility of the emergence of “documentary” games, striving for authentic representation of lived experience. In their understanding, “documentary games should strive to demonstrate the constraints that produce actual events, to find the limits of human experience and ask what rules constrain that experience such that it takes place in a certain way” (p. 16). In doing so, these games have the potential to expose the underlying social, political, and historical processes of that experience and promote deeper understandings thereof. In Czechoslovakia 38-89: Assassination, we have tried to create a “realistic” serious game, built on authentic memories of World War II. During the development process, we dealt with various challenges, stemming both from the affordances and limitations of the medium as well as the contested nature of the topic itself. The following case study tries to revisit these challenges and lay down a theoretical framework, in which these tensions can be addressed. This framework aims to tackle the above-mentioned issues by integrating the following five design principles: (a) multiperspectivity, (b) authenticity, (c) constructivism, (d) inclusiveness and (e) contextualization. The case study’s aim is twofold: On a theoretical level, it aims to broaden our critical understanding of the possibilities and challenges of historical representations in serious videogames; on a practical level, it aims to elaborate a framework that could be adopted by other serious games researchers and designers in different contexts. Czechoslovakia 38-89: Assassination is a complex, single-player, dialog-based, adventure game with a strong narrative. It includes interactive comics and authentic audiovisual materials. The game presents key events from Czechoslovakia’s contemporary history and enables players to “experience” these events from different perspectives. It aims to develop a deeper understanding of the multifaceted political, social and cultural aspects of the time period (Šisler et al., 2014). Its content stems from historical research and personal testimonies. Emphasis is placed on the diverse historical experiences of the population, including previously marginalized groups. The game comes in two versions: one designed specifically for schools and one for the general public. Both versions were released in June 2015. The story of Czechoslovakia 38-89: Assassination covers the period following the assassination of Reinhard Heydrich, “Reichsprotektor” of the Nazi-occupied Czech Territories - the Protectorate of Bohemia and Moravia - and a leading architect of the Holocaust. The attack triggered a wave of brutal retributions by the German occupying forces, including the decimation of the Czech village Lidice. These retributions created an atmosphere of terror and fear. Players take on the role of a grandson or granddaughter of J. Jelinek, the fictional main protagonist in the evolving narrative, and engage in conversations with various eyewitnesses to reconstruct Mr. Jelinek’s personal story and find out the reasons for his arrest after Heydrich’s assassination (Pötzsch & Šisler, 2016). Figure 1. A dialog scene in Czechoslovakia 38-89: Assassination. Regarding gameplay, Czechoslovakia 38-89: Assassination is essentially an adventure game. Its core elements are conversations with “eyewitnesses,” where players choose between different responses from predetermined dialogue trees and influence the further development of the story (Figure 1). Some responses trigger testimonies by the “eyewitnesses” that are rendered as interactive comics (Figure 2) and/or mini-games of various genres (Figure 3). The game presents players with a central puzzle concerning the reasons for their grandfather’s arrest and has several potential endings. Depending on their actions, players might (or might not) discover the underlying story and “win” the game. Figure 2. 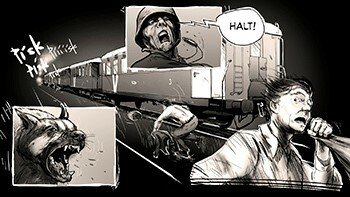 An interactive comic in Czechoslovakia 38-89: Assassination. Figure 3. A mini-game in Czechoslovakia 38-89: Assassination. Unlike narratives, videogames are a kaleidoscopic form of representation that can provide us with multiple and alternative points of view. As Frasca (2004) has argued, by accepting this paradigm players can realize that there are many possible ways to deal with their personal and social reality. Czechoslovakia 38-89: Assassination introduces eight different characters to the player. Each of these characters presents a significantly different personal story, historical narrative and evaluation of the unfolding events. These characters include people of various ages, genders, ethnicities and political and social backgrounds: a factory worker, who was in the Resistance movement; a post clerk, who served a prison term as a political prisoner; a journalist, who started his career in a Czech nationalist newspaper and became a collaborator with the Nazi regime; a Jewish architect, who was a communist activist and a Holocaust survivor; a young Romani girl, who lost her family during the war; a Bohemian musician, who fled the country and joined the Allies; a court clerk, who struggled with daily life under the Nazi Protectorate; and a Sudeten German, whose career had turbulent ups and downs during and after the war. The player has the opportunity to speak to all these characters during the game and has to critically analyze and compare not only their different, unique personal stories, but also their oftentimes contradicting worldviews and perceptions of historical events (Pötzsch & Šisler, 2016). During the development of the game, the key challenge we faced regarding multiperspectivity was which memories and “testimonies” to include and which not, given the limited resources and gameplay. It should be noted that many issues related to World War II still resonate in the Czech public sphere and continue to influence significantly the political scene (e.g. the assassination of Heydrich and its consequences, the expulsion of the German-speaking citizens and the treatment of the Romani population). We deliberately included historians with different perspectives in the team, including researchers from the Institute of Contemporary History of the Academy of Sciences of the Czech Republic and the Faculty of Arts of Charles University. The involvement of these various teams significantly prolonged the development phase, since the debates between them were often long and tackled fundamental issues. However, this process arguably increased the game’s overall integrity. Importantly, by integrating these debates in the pre-production phase, we made a meaningful connection between the game’s content and debates resonating within the Czech and other Central-European, as well as Eastern-European public spheres. History is an enterprise that necessitates selection (Carr, 1961). The story space in which the narrative is produced is a construct that is built by the historian, and this includes the process of selecting evidence. At its simplest, this entails who, where, what and when will be included (Chapman, 2013, p. 323). By the same token, videogames are metonymic narrative devices, with the developer making similar choices to the historians who write “proper” history. Criticizing Galloway’s (2006) claim that algorithmic videogames “erase” history, Chapman (2013, p. 315) argues that far from being a destructive process of eradicating the “truth” of the past, the production of a videogame-based history (like any history) is a creative process. In it, meaning is produced even while a duty of care is owed to the referential nature of the evidence. We adopted Chapman’s (2013) perspective and included it in our design process. Despite the initial skepticism among many of “our” historians towards the videogame medium, we finally devised an internal peer-review process whereby different teams of historians critically commented on their colleagues’ choices regarding which testimonies and perspectives to include and which to leave out. More importantly, we tried to make our selection process and its underlying ideological dimension transparent by framing our game in the multiperspectivity framework for history teaching (Stradling, 2003); that is, in the para-textual materials (the game’s website, teacher’s manual, etc.). Czechoslovakia 38-89: Assassination’s content derives from historical research on the possible manifestations of experiencing the history of Czechoslovakia during the second half of the 20th century. It is also based on the real personal testimonies of eyewitnesses to the above-mentioned periods. Nevertheless, Czechoslovakia 38-89: Assassination does not adapt these real stories in a literal fashion: Rather, it uses them as sources for constructing realistic and appealing narratives. This design principle arguably enabled us to produce appealing stories with a number of authentic details without “gamifying” real persons’ - oftentimes ethically- and emotionally-charged - testimonies (Šisler et al., 2014). The key challenge we faced regarding authenticity concerns a core set of questions related to the project as a whole, which had far-reaching consequences. How can “authenticity” be recreated in a videogame? How can a medium whose core affordance is to run and execute processes and rule-systems, deal with real historical memories? We acknowledge that authenticity is not a given but is negotiated; it is, in the words of Salamandra (2004, p. 4), “a field of contestation rather than an essence”. Yet, unlike lens-based media, which can rely on the transparency of the image, authenticity in a videogame has to be further reconstructed and asserted by other means (Halter, 2006). We faced this issue on two separate, yet entangled, levels: (1) on the level of procedural representation and the possibility of “replaying” the past; and (2) on the level of selecting the appropriate game genre and reconstructing the dialogue with each character. Regarding procedural representation and replaying history, McCall (2011, p. 12) argues that simulation games, which allow for replaying history, are exceptionally well suited to the promotion of historical questions. As he says, “the understanding of systems and contexts essential to historical interpretation that a historical simulation game can generate goes beyond that created by many other kinds of secondary sources. … It is a matter of putting students into dynamic recreations of roles and situations from the past. A simulation can place students at the center of complex systems where a variety of variable factors ebb and flow simultaneously in ways that cannot be readily represented in other media” (McCall, 2011, p. 13). Taking a different tack, Schut (2007, p. 224) suggests that because videogames are systematic in nature, it is at best very difficult to use them to present humans with agency beyond predefined parameters. In other words, historical actors are only free to do what the game allows them to do, and what they are allowed to do in most historical games is only what a preset social role defines. Regarding simulation games that allow for replaying the past, Schut (2007, p. 225) contends that since a simulation is, by necessity, a simplification of something much more complex, it could not completely capture even systematic elements of life (such as a local government bureaucracy governed by established procedures and composed of people in clearly defined roles). Moreover, there are many elements of life that defy practically any serious attempt to simulate them. The time period we represent in Czechoslovakia 38-89: Assassination includes a highly complex set of political, social, economic and cultural factors, which would be increasingly difficult to simulate without schematizing the ethically- and emotionally-loaded experiences of people who lived through that difficult period. In other words, we discovered that we were unable to construct a complex rule-system that would, in the words of McCall (2011, p. 23), offer “defensible explanatory models of historical systems” as its core gameplay element. Thus, we decided early on not to allow the players to replay the individual stories and thus possibly change the course of history. The past in Czechoslovakia 38-89: Assassination is fixed in such a way that players approach the “testimonies” in the present and can choose what and how to ask “eyewitnesses,” yet they cannot alter those persons’ stories. Simultaneously, instead of a simulation game we opted for an adventure-genre game where the complexity of the time period and the difficult choices individuals faced are presented via secondary narratives (i.e. the personal and subjective testimonies of the in-game characters) and not via a direct role-playing by the player. In other words, Czechoslovakia 38-89: Assassination does not allow for procedural representation of history. Instead, its rule-systems procedurally represent the dialogues with individual in-game characters. Regarding the dialogues taking place in “the present,” we had to transform the typically linear oral testimony into a dialogue-tree structure that would allow the players to choose the content as well as the tone of their inquiries. Since one “real” oral testimony does not typically cover all the topics about which we would like to provide the players the opportunity to ask, we oftentimes combined several “real” testimonies into one fictional character, while trying to maintain as much congruence between the different personal narratives as possible. The result could be labeled a “fictitious” assemblage of authentic testimonies. As is the case with any documentary material, the final result is constructed, inherently creating a discrepancy between the “real” and its representation. From a broader perspective, imitation (mimesis) always involves selecting something from the continuum of experience, thus giving boundaries to what really has no beginning or end (Davis, 1992, p. 3). This view accepts the discrepancy between reality and representation, and though mimesis is imitative (particularly given the referential nature of history), we can never properly imitate (Chapman, 2013, p. 323). We have tried to approach this discrepancy in a meaningful way by emphasizing it, instead of obscuring it; by visually separating the “real” materials (film clips, newspapers and radio broadcasts) from “constructed” materials (black-and-white comics). 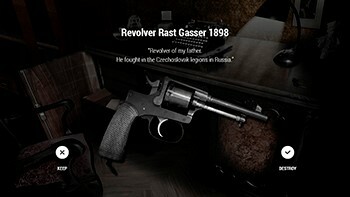 When the in-game characters talk about general, well-documented events from the past, we provide players with film clips, newspapers or radio broadcasts from the historical time period, which are related to that event. When the in-game characters talk about their personal “memories” and/or show players personal objects from the past, their “memories” are rendered as black-and-white comics and their personal objects as comic-style props (Figure 4). All these sources of information are equally open to the players’ critical reading and evaluation. The emphasized separation is further utilized in the methodological materials for teachers using the game in schools, where the “constructedness” of the comic-style props is used as an invitation to think critically about the authored nature of all historical materials, including the “authentic” film clips that are deliberately selected and presented to the players. Figure 4. A comic-style prop in Czechoslovakia 38-89: Assassination. As has been said, Czechoslovakia 38-89: Assassination does not allow players to “change history” or take part in counterfactual historical scenarios. In the words of Pötzsch and Šisler (2016, p. 17), “what is open to negotiation in and through play are discourses about the past, rather than the past itself”. Players in the game interact with the “eyewitnesses” in the present and “travel” back in time through these “eyewitnesses”’ memories evoked during conversations. The individual testimonies are oftentimes contradictory and incomplete, or the “eyewitnesses” simply do not want to talk about certain aspects of their past with the players. As a result, players have to evaluate critically the obtained information, use social skills and empathy, and approach the social construction of history analytically. Stemming from pedagogical constructivism (Piaget, 1962), the game presents history as neither a closed past, nor a collection of events and definite conclusions. It is rather a platform for questions to be asked. According to Chapman (2013), historical games have the inherent potential not only to convey certain historical facts, but also to enable reflections about the nature of history and historiography in general and to raise awareness of the ultimate contingency of any recollection of the past. Operating within the constructivist framework, we tried in Czechoslovakia 38-89: Assassination to invite such meta-historical reflections by combining documentary movie clips and historically-inspired narrative with active exploration of idiosyncratic personal experiences and memories (Pötzsch & Šisler, 2016). The key challenges we faced regarding constructivism were twofold: first, how to deal with conflicting personal “testimonies” that oftentimes contradict one another; and second, how to transform linear testimonies into game-like dialogues. Regarding the former, we deliberately chose to keep the contradictions and discrepancies between individual “testimonies” in the game and let the players deal with them critically. We strove not to give implicit approval of any of the conflicting personal narratives or to offer players any overarching framework that would resolve the contradictions. The moral choices about whom to trust and how to “read” the individual “testimonies” are left to the players. Nevertheless, the game contains an extensive encyclopedia that provides players with factual information about the given period based on the research carried out by historians involved in the development process. Regarding the second issue, we had to find a way to transform linear testimonies, as selected and/or constructed by the historians, into game-like dialogues. We tried to solve this issue by employing a rigid formal structure for the specification of game dialogues. Essentially, the structure organizes all dialogues into hierarchical and finite state machines made of dialogue trees for capturing dialogue possibilities for individual characters. The initial idea was to create a formal, yet simple enough, structure to enforce a common design language among all team members. In practice, fundamental discrepancies between the “languages” various team members used and their respective knowledge domains appeared. Most of the historians and educationalists did not adopt the formal, hierarchical, finite state machines for structuring dialogues and operated in linear oral-history discourse. We had to formalize a top-down design process, during which game designers incrementally refined the in-game dialogues together with historians, educationalists and artists. At many points, changes proposed by game designers and artists - and perceived as “minor” by them - were strongly opposed or vetoed by historians. Again, this significantly prolonged the development phase, yet arguably it helped us to maintain historical accuracy and avoid schematizations. As Schut (2007, p. 221) argues, most historical digital games focus almost exclusively on politics, economics and war. Köstlbauer (2013) adds that many historically-inspired digital war games exclude such aspects as civilian casualties or the unintended sociopolitical and economic long-term consequences of military actions. However, partly as an attempt to correct the hegemonic bias of traditional historical research, the discipline of history has broadened its scope to include a great diversity of subjects. Social, cultural and critical histories are particularly valuable for emphasizing the significance of people ignored in the traditional accounts of rulers, merchants and military campaigns (Schut, 2007, p. 221). Czechoslovakia 38-89: Assassination includes marginalized voices that are not typically presented in the dominant history discourse in the Czech Republic. 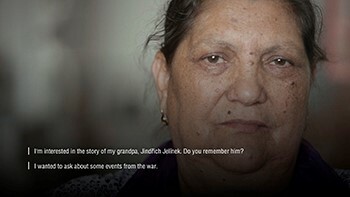 These include the memories of a Romani girl, who went through the atrocities of the Romani genocide during World War II and who is now, as an elderly lady, talking openly about the (mis)treatment of the Romani population, both during the socialist and the current post-socialist periods (Figure 5). Simultaneously, the game features the memories of a Czech journalist, who became an active supporter of the occupying regime and who justifies his past decisions to the player. Finally, we have included testimony from a Czech German-speaking citizen (a Sudeten German), who was an active member of the Sudeten German Party (SdP, Sudetendeutsche Partei) and was (along with other millions of Germans living in Czechoslovakia at the time) forcibly expelled from the country after World War II. Figure 5. A dialog scene in Czechoslovakia 38-89: Assassination. The key challenge we faced regarding this kind of inclusiveness is fundamentally related to the political and cultural struggle over Czech contemporary history and identity. All the above-mentioned perspectives are not generally present in Czech history-textbooks. Moreover, they challenge the dominant narrative of the Czech post-war identity and are still today seriously contested issues in public debates. In particular, the post-war histories of Romani people and Sudeten Germans regularly become heated topics in local, national and even European elections. By including these perspectives in our serious game, we wanted to create a meaningful platform for debate on Czech and Czechoslovak contemporary history, which naturally includes different ethnicities and nationalities. This inclusion was not unequivocally accepted by the general public, as we have discussed in Pötzsch and Šisler (2016). Galloway (2004) has argued that a realistic videogame should maintain a kind of congruence, for example some type of fidelity of context that transliterates itself from the social reality of the gamer into the game environment and back again. Galloway calls this the “congruence requirement,” which is necessary for achieving “realism” in gaming. In other words, because games are an active medium, “realism” in gaming requires that the game is able to mimic and extend the social reality known and lived by the gamer. Czechoslovakia 38-89: Assassination deals with topics from Czech, Central- and Eastern-European contemporary history that are often subject to heated discussions and public debates. Given the design of the game, each player can progress through it via different people’s stories and ask these people different, pre-scripted questions, including about ethically- and emotionally-contested issues. Each player can choose a different path in the interviews and thus have - to a certain extent - a unique gaming experience. Within schools, the students’ in-game experiences are then subject to debriefings, which constitute an important part of the game’s educational methodology. The game serves not only as a data source in and of itself, but it also naturally stimulates debate and further inquiries. The teacher has the opportunity to contextualize the game’s content, for example the “eyewitnesses”’ testimonies and the decisions made in the mini-games, and relate them to real-world contexts. Yet, when played outside the formal schooling context, the game also strives to maintain congruence with players’ social reality. The players enter the game from a position that mimics in a way their current reality: The character they play (the grandson or granddaughter of J. Jelinek) does not have the direct experience of World War II and has to discover what really happened in the past via mediated sources, that is, personal “testimonies”, documents and diaries. As Chapman (2013, p. 318) puts it, “[i]t is this constant interplay between the socio-historic setting of play(er) and the setting of the videogame, the ability of the historical videogame to allow the player to engage in terms of their own historical understanding, that most highlights that the meaning of play can indeed be a rich representational process rather than only a series of actions with no mimetic aspect”. As we have argued elsewhere (Pötzsch & Šisler, 2016, p. 2), historical videogames may not necessarily have a determinate impact on players or historico-political discourses, but their particular features invite certain responses and particular subject positions and encourage certain understandings. This happens before the latter are actively negotiated in situated practices of reception. For the analysis of reception of Czechoslovakia 38-89: Assassination among the Czech public, I have used a pluri-medial analysis introduced by Erll (2008) to the field of film studies and appropriated and refined by Pötzsch and Šisler (2016) for game studies. In a nutshell, pluri-medial analysis looks into contextual factors that might facilitate or undermine the realization of the varied memory-making potentials established by the “text” of the medium. Both empirical audience research and analysis of distribution patterns, reviews or educational packages provide perspectives on the pluri-medial level (Pötzsch & Šisler, 2016, p. 7). Czechoslovakia 38-89: Assassination was released on 4 June 2015 in both an educational and a commercial version. The educational version is accompanied by a detailed methodology for teachers on how to use the game in the classroom. It also contains a teacher interface. The commercial version contains more game-like elements and has a modified gameplay. Both versions will be treated separately when investigating their reception. The educational version of the game was evaluated in Czech high-school and elementary-school classes in 2013 (Šisler et al., 2014). Nine teachers (four females, five males) took part in the evaluation and we received 562 feedback questionnaires from students. The teachers taught a total of 30 lessons in 13 different classes. They used a prototype of Czechoslovakia 38-89: Assassination that we provided, as well as a school computer and an overhead projector. The feedback report for each lesson included 26 questions on the following topics: the progress of the individual lesson, students’ reactions, evaluation of the usefulness of content taught and an evaluation of the game’s concept. Students completed a short pen-and-paper questionnaire at the end of each lesson. For the sake of brevity, I present only a short summary of the results here and reference Šisler et al. (2014) for details. The evaluation’s key results show that students perceive the game to be attractive, authentic and immersive. They self-report that it enabled them to develop a better understanding of the time period. The results also indicate that students appreciate the multiperspectivity, that is, the inclusion of different personal “testimonies” and the use of authentic audiovisual materials and documents. They also gave positive feedback on the fact that the characters in the game are based on real persons’ testimonies, yet the game does not directly appropriate these testimonies. Finally, students mentioned the possibility of influencing the story actively through their own decisions as an advantage of the game over “traditional” teaching methods (Šisler et al., 2014). For teachers, the game is a learning tool that motivates students to learn about Czech and Czechoslovak contemporary history, stimulates debate and inquiries and provides multifaceted perspectives on historical events. Similarly, teachers appreciate the game as immersive and stimulating the students’ attention. We found no gender differences related to perception and acceptance of the game, among teachers and students (Šisler et al., 2014). The evaluation study was not without limitations. First, it is important to note that we have not conducted a formal assessment of students’ knowledge apart from collecting their own feedback and soliciting final reports from teachers. We plan tests of factual knowledge as part of future works. Second, our experimental evaluation study sample was not unbiased. We can assume that teachers, who voluntarily attended our instructional seminar and implemented Czechoslovakia 38-89: Assassination in their courses, are possibly positively biased towards videogames as educational media. The game is currently being prepared for a second round of experimental evaluation; aiming to investigate a more traditional and diverse audience. The launch of the commercial version of Czechoslovakia 38-89: Assassination has been widely publicized in the Czech press and on Czech television (Pötzsch & Šisler, 2016). Generally, reviews praised the game for its historical theme, graphical representation and non-schematized depiction of history. Kouba (2015), for instance, notes that the game “presents history from many perspectives,” while Grygar (2015, p. 67) asserts that Czechoslovakia 38-89: Assassination “presents ‘ordinary’ stories of ‘ordinary’ people living in a period that was anything but ordinary. It excels in realistic depiction of small choices and compromises that could have had devastating consequences. At the same time, the game does not judge these choices - this is something left to the players”. Bendová (2015) writes that the game “evokes the nature of the historical work, that is, the need to look at matters from different angles and work with very diverse materials that always somehow filter or facilitate historical facts in a specific way” . While the game’s historical content was widely commended, the game mechanics drew criticism. Grygar (2015, p. 67), for example, notes that Czechoslovakia 38-89: Assassination constitutes “a suggestive excursion to a dark period of our history that functions well as an interactive document. We can only imagine how it could have worked if the authors had included more well-designed game elements”. Similarly, the game is described by Kouba (2015) as “a unique experiment that defines a new genre of interactive educational document. Yet, should we evaluate it as a game, it would fail”. Bendová (2015) directly criticizes the impossibility to replay the past: “[W]e are not allowed to experiment truly with what might happen under different circumstances, which could lead to a better and more internalized understanding of historic events”. The pluri-medial analysis reveals a widespread perception of Czechoslovakia 38-89: Assassination as a relevant articulation within Czech historical discourse. Both critics and promoters apparently agree on the discursive significance of the game - a fact that points to a certain realization of the potential for memory-making in pluri-medial constellations (Pötzsch & Šisler, 2016). At the same time, Czechoslovakia 38-89: Assassination has been criticized for its limited level of interactivity and exclusion of replaying the past, that is, for the absence of procedural representation of history. All media have a bias; that is, all media are predisposed to certain patterns of communication (Innis, 1951). Mainstream videogames tend to have a mechanistic, reductionist bias toward representation of history and war. This is tied to their core characteristic: procedurality. Even though this reductionist bias may be overcome in audiovisual or narrative layers of representation or even outside the “text” of the game, it remains a fundamental aspect of the procedural layer of representation, that is the representation through the game’s rule-system. Nevertheless, there are many videogames, particularly within the emerging serious-games genre, that strive to overcome the medium’s “procedural bias” and aim to provide more “authentic” and “realistic” accounts of history and war. These games are typically based on personal testimonies, include multifaceted perspectives and revisit the civilian trauma of war. Many serious games aspire to meet Galloway’s (2006, p. 75) criteria for “realist videogames” in the sense that they strive not only for mere “realistic” representations, but also aim to “reflect critically on everyday life: with its struggles, personal drama and injustices”. In her book on “critical play”, Flanagan (2009) investigates videogames that, through their procedural rhetoric and/or narrative frames, challenge and potentially innovate established design practices and generic conventions with the objective of putting videogames at the service of progressive aims. As Pötzsch (2015, p. 7) adds, Flanagan’s “critical game design” argues for the importance of “political conscientious and self-reflective game design to enable an active reshaping of game industries and cultures beyond focus on mere entertainment and market shares”. Videogames are increasingly being used in formal education (Sitzmann, 2011; Whitton, 2014). Dozens of comparative studies examining the learning effects of videogames relative to the learning effects of “traditional” types of instruction are now available. Although there is a general agreement that videogames can improve learning (Sitzmann, 2011; Wouters, van Nimwegen, van Oostendorp & van der Spek, 2013; Clark, Tanner-Smith & Killingsworth, 2014), there is much less solid empirical information on which game features support this process (Mayer, 2014). At the same time, there are very few evidence-based guidelines for game designers on how to design realistic serious games for the humanities. In this article, I have tried to put forward a theoretical framework that stems from our experience with developing the serious game Czechoslovakia 38-89: Assassination - a realistic game built on authentic memories of World War II. The framework integrates five design principles: (a) multiperspectivity, (b) authenticity, (c) constructivism, (d) inclusiveness and (e) contextualization, which deal both with the challenges of the medium as well as the contested nature of the topic itself. Importantly, and in line with Flanagan (2009), the underlying logic of these design principles emphasizes the transparency and self-reflexivity of the whole process, where possible discrepancies between historical reality and representations thereof are underscored rather than obscured by the resulting game text. Revisiting Zimmerman’s (2013) notion of the “ludic century,” I argue that serious videogames are a medium of 21st century realism. Within this realism, the player actively takes the position of constructing reality from historical recreations (Bogost & Poremba, 2008). At the same time, realism in serious gaming enables a revisiting of the medium’s material substrate and establishes correlations with specific activities existent in the player’s social reality (Galloway, 2004). Anchoring the videogame medium within previous waves of realism, “realist” serious games should ultimately reveal new knowledge about the world by exposing underlying systems and embedding participants; building new media literacies and new forms of cultural critique (Bogost & Poremba, 2008). Such serious historical games could, in line with Chapman (2013), offer a layer of information that literary and visual media can not. This will allow for the “values ascribed to the objects and institutions of the past to be understood in new ways by seeing… their interplays and experiencing rule structures that enable these inter-relations to be actively extricated” (Chapman, 2013, p. 328). I would like to thank Jaroslav Pinkas and Holger Pötzsch for their insightful comments on the earlier versions of this text. I would also like to thank the development team behind Czechoslovakia 38-89: Assassination, namely Richard Alexander, Jakub Gemrot, David Vávra, Lukáš Kolek, Ondřej Paška, Jana Fantová, Tereza Selmbacherová, Petr Novák, Brady Clough, Shawn Clybor, Jaroslav Cuhra, Marie Černá, Jiří Hoppe, Stanislav Kokoška, Kamil Činátl, Jaroslav Pinkas, Cyril Brom, Tomáš Vlček, Matěj Beran and others. This study was partially supported by Charles University’s project GA UK No. 227 006 and the EEA Grants and Norway Grants project “Virtual Memories”. The author declares the following potential conflicts of interest with respect to the research, authorship and/or publication of this article: Vít Šisler was a lead designer of the game, Czechoslovakia 38-89: Assassination, that is analyzed in the present article. Šisler’s employer, Charles University, earns revenue from the game’s commercial version. Translations from Czech originals by Vít Šisler and Brady Clough. 11 bit studios S.A. (2014). This War of Mine. 11 bit studios S.A.
Atkins, B. (2005). History is Bunk? Historiographic Barbarism in Civilization [preprint, original English draft], published as Atkins, B. (2005). La Storia èun’Assurdità: Civilization Come Esempio di Barbarie Storiografica? In M. Bittanti (Ed. ), Civilization. Storie Virtuali, Fantasie Reali (pp. 65-81). Milan: Costa & Nolan. Bendová, H. (2015). Československo 38-89: Atentát. Jak Rozehrát Českou Historii, Game Art. Retrieved from http://cas.famu.cz/gameart/page.php?page=16. Accessed November 28, 2016. Bogost, I. & Poremba, C. (2008). Can Games Get Real? A Closer Look at “Documentary” Digital Games. In A. Jahn-Sudmann & R. Stockmann (Eds. ), Computer Games as a Sociocultural Phenomenon: Games without Frontiers, War without Tears (pp. 12-21). New York: Palgrave Macmillan. Carr, E.H. (1961). What Is History? New York: Random House. Chapman, A. (2013). Is Sid Meier’s Civilization History? Rethinking History, 17:3, 312-332. Chapman, A. (2016). Digital Games as History: How Videogames Represent the Past and Offer Access to Historical Practice. New York: Routledge. Charles University and the Academy of Sciences of the Czech Republic (2015). Czechoslovakia 38-89: Assassination. Karolinum Press. Clark, D., Tanner-Smith, E., & Killingsworth, S. (2014). Digital Games, Design and Learning: A Systematic Review and Meta-Analysis (Executive Summary). Menlo Park, CA: SRI International. Davis, M. (1992). Aristotle’s Poetics: The Poetry of Philosophy. New York: Rowman and Littlefield. Elliott, A.B.R. & Kapell, M.W. (2013). Introduction: To Build a Past That Will ‘Stand the Test of Time’ - Discovering Historical Facts, Assembling Historical Narratives. In M.W. Kapell and A.B.R. Elliott (Eds. ), Playing with the Past: Digital Games and the Simulation of History (pp. 1-29). New York: Bloomsbury. Erll, A. (2008). Literature, Film, and the Mediality of Cultural Memory. In A. Erll & A. Nünning (Eds. ), Cultural Memory Studies: An Interdisciplinary Handbook (pp. 389-398). Berlin: Walter de Gruyter. Fog, S. (2011). First Person Victim. Aalborg University. Frasca, G. (2004). Videogames of the Oppressed: Critical Thinking, Education, Tolerance, and Other Trivial Issues. In N. Wardrip-Fruin & P. Harrigan (Eds. ), First Person: New Media as Story, Performance, and Game. Cambridge: The MIT Press. Galloway, A. (2004). Social Realism in Gaming. Game Studies, 4:1. Retrieved from http://www.gamestudies.org/0401/galloway. Accessed November 28, 2016. Galloway, A. (2006). Gaming: Essays on Algorithmic Culture. Minneapolis: University of Minnesota Press. Grygar, L. (2015). Československo 38-89: Atentát. Škola Hrou. Level, 257, 66-67. Halter, E. (2006). From Sun Tzu to Xbox, War and Video Games. New York: Thunder’s Mouth Press. Innis, H.A. (1951). The Bias of Communication. Toronto: University of Toronto Press. Köstlbauer, J. (2013). The Strange Attraction of Simulation: Realism, Authenticity, Virtuality. In A.B.R. Elliott & M.W. Kapell (Eds. ), Playing with the Past: Digital Games and the Simulation of History (pp. 169-183). New York, NY: Bloomsbury. Kouba, J. (2015). Československo 38-89: Atentát - Vzdělávání na Prvním Místě. Bonusweb. Retrieved from http://bonusweb.idnes.cz/ceskoslovensko-38-89-atentat-recenze-duq-/Recenze.aspx?c=A150624_190603_bw-pc-recenze_oz. Accessed November 28, 2016. Mayer, R. (2014). Computer Games for Learning: An Evidence-Based Approach. Cambridge, MA: The MIT Press. McCall, J.B. (2011). Gaming the Past: Using Video Games to Teach Secondary History. New York: Routledge. Möring, S.M. (2013). Games and Metaphor - A Critical Analysis of the Metaphor Discourse in Game Studies. Unpublished doctoral thesis. Copenhagen: IT University of Copenhagen. Pötzsch, H. (2015). Selective Realism: Filtering Experiences of War and Violence in First- and Third-Person Shooters. Games and Culture [Online First], 1-23. Retrieved from http://gac.sagepub.com/content/early/2015/05/29/1555412015587802. Accessed November 28, 2016. Pötzsch, H. & Šisler, V. (2016). Playing Cultural Memory: Framing History in Call of Duty: Black Ops and Czechoslovakia 38-89: Assassination. Games and Culture [Online First], 1-23. Retrieved from http://gac.sagepub.com/content/early/2016/03/21/1555412016638603. Accessed November 28, 2016. Power, M. (2009). Digital War Games and Post-9/11 Geographies of Militarism. In R. Schubart, F. Virchow, D. White-Stanley, & T. Thomas (Eds. ), War Isn’t Hell, It’s Entertainment: Essays on Visual Media and the Representation of Conflict (pp. 198-215). London: McFarland. Rosenstone, A.R. (1995). Visions of the Past: The Challenge of Film to Our Idea of History. Cambridge, MA: Harvard University Press. Rosenstone, A.R. (2006). History on Film/Film on History. Harlow: Pearson Education Limited. Salamandra, C. (2004). A New Old Damascus: Authenticity and Distinction in Urban Syria. Bloomington: Indiana University Press. Schama, S. (2004). Television and the Trouble with History. In D. Cannadine (Ed. ), History and the Media (pp. 20-33). London: Palgrave Macmillan. Schut, K. (2007). Strategic Simulations and Our Past: The Bias of Computer Games in the Presentation of History. Games and Culture, 2:3, 213-235. Schut, K. (2014). They Kill Mystery: The Mechanistic Bias of Video Game Representations of Religion and Spirituality. In H.A. Campbell & G.P. Grieve (Eds. ), Playing with Religion in Digital Games (pp. 255-275). Bloomington: Indiana University Press. Serious Games Interactive. (2007). Global Conflicts: Palestine. Runesoft GmbH. Sicart, M. (2011). Against Procedurality. Game Studies, 11:3. Retrieved from http://gamestudies.org/1103/articles/sicart_ap. Accessed November 28, 2016. Šisler, V. (2008). Digital Arabs: Representation in Video Games. European Journal of Cultural Studies, 11:2, 203-220. Šisler, V. (2016). Procedural Religion: Methodological Reflections on Studying Religion in Video Games. New Media & Society [Online First], 1-16. Retrieved from http://nms.sagepub.com/content/early/2016/05/25/1461444816649923. Accessed November 28, 2016. Šisler, V. & Brom, C. (2008). Designing an Educational Game: Case Study of ‘Europe 2045’. In Transactions of Edutainment I (pp. 1-16). Berlin: Springer-Verlag. Šisler, V., Selmbacherová, T., Pinkas, J., & Brom, C. (2014). Teaching Contemporary History to High School Students: The Augmented Learning Environment of Czechoslovakia 38-89. Masaryk University Journal of Law and Technology, 8:1, 99-122. Sitzmann, T. (2011). A Meta‐Analytic Examination of the Instructional Effectiveness of Computer‐Based Simulation Games. Personnel Psychology, 64:2, 489-528. Stradling, R. (2003). Multiperspectivity in History Teaching: A Guide for Teachers. Council of Europe. Retrieved from https://book.coe.int/eur/en/history-teaching/2593-multiperspectivity-in-history-teaching-a-guide-for-teachers.html. Accessed November 28, 2016. Swenson, M. (2014). 1000 Days of Syria. Played online from http://www.1000daysofsyria.com/. Accessed November 28, 2016. Wouters, P., van Nimwegen, C., van Oostendorp, H., & van der Spek, E.D. (2013). A Meta-Analysis of the Cognitive and Motivational Effects of Serious Games. Journal of Educational Psychology, 105:2, 249-265. Zimmerman, E. (2013). Manifesto: The 21st Century Will Be Defined By Games. Kotaku. Retrieved from http://kotaku.com/manifesto-the-21st-century-will-be-defined-by-games-1275355204. Accessed November 28, 2016.